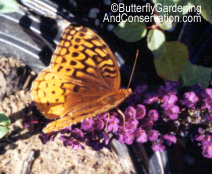 Great Spangled Fritillaries are somewhat large butterflies with a wingspan of around 7-9cm. Host plants are violets such as Wild Violet (Viola sororia). Eggs are pale yellow and laid singly near host plants. Eggs are laid in late summer. Newly hatched caterpillars hibernate through the winter without eating first. In the spring when the violets start growing again they begin to eat.